Professor Green has admitted to losing his cool when attending the Britain First march for his new documentary. 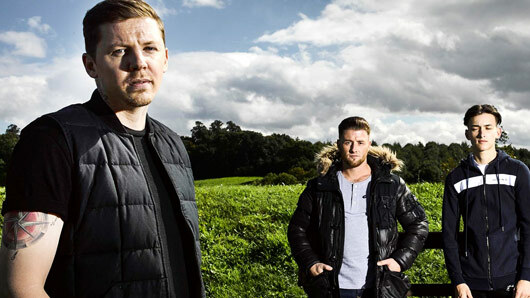 Appearing on Good Morning Britain today to discuss his two-part series, Working Class White Men, rapper Professor Green explained how the documentary explores the obstacles men from poor backgrounds face in Britain, and how this has led to discrimination against immigrants. In order to get to the root of this stigma, Pro Green decided to speak to members of far-right political party Britain First at one of their protest marches. The filmmaker confessed it was difficult to maintain a level head when interviewing certain people for the series. “It was difficult,” he said. “Christian, the director, said to me, ‘Remember the question is why, it’s always why, don’t show your hand too early’ – because it would be really easy for me to jump down [these people’s] necks with my thoughts and opinions. “What they think is very conflicting with my own opinions. But to get to the bottom of why someone feels like that, they have to be given space. Working Class White Men airs tonight (Tuesday) at 10pm on Channel 4.